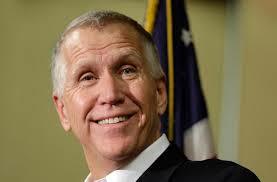 WataugaWatch: Thom Tillis, the First Manchurian Candidate? In 2014, Thom Tillis beat incumbent Senator Kay Hagan by a margin of 1.7% of the vote. At the time it was the most expensive Senate race in history with total spending above $121 million. At least $345,000 of that money went to Cambridge Analytica, the data company now accused by a whistleblower of stealing the personal information on 50 million users from Facebook to help Donald Trump get elected. That money was paid by Thom Tillis himself and the North Carolina Republican Party. Apparently, getting Thom Tillis elected two years before Trump's campaign was a kind of dress rehearsal on how to manipulate individual voters based on a Facebook personality survey. Cambridge Analytica brags about it as a "case study" on their web site and claims they raised "voter performance" by over 12%. We say "at least $345,000" because the John Bolton SuperPAC, which spent nearly $1.5 million to benefit Tillis and damage Hagan in that 2014 campaign, also paid Cambridge Analytica some $341,000 "for messaging consulting." The Facebook data came from an app that paid users to take a personality test but also collected data from those users' friends. The data was given by Facebook to a Cambridge University professor who was supposedly doing academic research. He passed the data to Cambridge Analytica. The professor is a Russia-born psychologist, Aleksandre Kogan, who actually built the app that gathered the personality data, so he knew exactly what he was looking for. Steve Bannon served as the vice president of Cambridge Analytica during the 2014 Thom Tillis race and until he joined the Trump campaign in 2016, and billionaire GOP donor Robert Mercer funded the startup of Cambridge Analytica as well as the startup of Breitbart News. Tillis may not have been clever enough to know what Cambridge was up to, but now realize that he got into office via questionable (and probably illegal assistance since it was foreign nationals working at CA ). I expect that the media focus ( and legislative inquiries in the UK and perhaps in the USA ) will forever tar Tillis with this connection. And if Rebecca Mercer becomes a pariah, and a toxic source of funds in future elections, it will be just desserts.